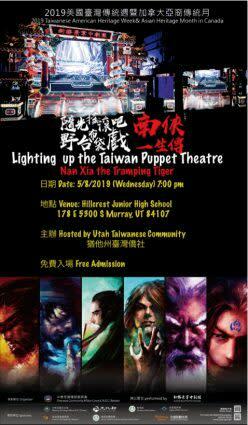 Please join us for the special event on 7:00 pm, May 8, 2019 (Wednesday) at Hillcrest Junior High School (178 East 5300 South, Murray, UT 84107).Headlined by a special performing group from Shinergy Puppet Show, the theme of the performance is "LIGHTING UP TAIWAN PUPPET THEATRE ~ Nan Xia, the Tramping Tiger". We're excited to share the Taiwanese Cultural performance with you.The event is free and open to the public.The total length of the performance is 90 minutes. Shinergy has explored ways to combine traditional performance with novel technology, evident in their latest Puppet Show in October 2018. Through 3D animation, light projection, scenes such as rain, snow and flower petals are portrayed, intensifying the audience experience. 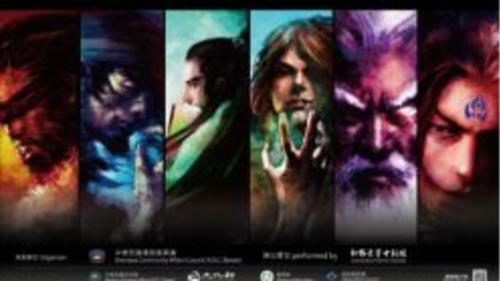 To ensure overall understanding of the dramatic-action and stories, subtitles are also provided in both Mandarin and English for local and foreign audience. The performance is hosted in both Chinese and English in order to enhance the interaction with the audience.Date: May 8, 2019 (Wednesday)Time: 7:00 PMVenue: Hillcrest Junior High School178 East 5300 South, Murray, UT 84107*See the attached file for a glance of the performance and the poster.